LALIBELA, Ethiopia — On the flight here, reading of the golden cross, known as Afro Ayigeba, perhaps the most sacred object in this East African country, I had no concept that in a few hours, a priest would be pressing the same cross against my face. Eleven rock-hewed churches, so remote that electricity arrived only a few years ago, are a World Heritage site, known as Africa’s Petra, visited by thousands of adventuresome international tourists annually. 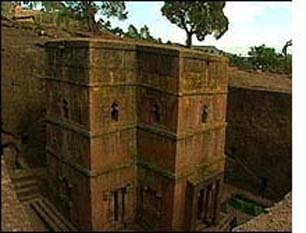 The monolithic churches, carved out of a 2,600-square-foot rock in the 12th century, were either created overnight by angels in a miracle or by 40,000 workers under King Lalibela, depending on which historical version you accept. We were visiting during the three days of Timkat (Epiphany), the biggest annual religious festival in a country where Christianity is the official state religion. “May anyone be blessed?” I asked our guide. I got in line. Soon, the priest in a shimmering white Orthodox robe was pressing this world famous cross against my cheek. It was stolen in 1997, sold to a Belgian antiquities dealer who eventually returned it to Ethiopia years later. Now, two men guard it 24/7. Visiting the churches, in two locations connected by a series of pitch dark tunnels, precipitous ledges, steep rock stairs to trap doors, is particularly challenging since shoes must be removed outside each church. Industrious locals provide assistance. The next afternoon, we joined hundreds thronging the famous Timkat procession, where priests hold high the Tabot symbolizing the Ark of the Covenant, containing the Ten Commandments. Traditional dress of dazzling white, contrasts against jewel colors of velvet and satin worn by the priests. I purchased a colorful, sequined fringed umbrella, pumping it up and down gleefully as we marched and danced en masse in the blazing sun along the only “paved” street, drums beating, people chanting, bells ringing, horns trumpeting. Periodically, as a planned part of the ceremony, groups of young men brandishing sticks mock-charged us from vendors’ tents on the sidelines. It was magic, glorious, and spectacular. A once-in-a-lifetime memory. Our destination was Tablot Maderia about a half-mile away on a promontory encampment with a specially built sacred pool of water to be used the next morning for blessing. We visited the encampment again in the night of flickering lamps where the Tabot is kept in a special tent and the faithful picnic, sing and dance in the smoldering incense until and after the 2 a.m. Mass. At dawn, the procession returns the Tabot to the church for another year, where only priests can see it. Inexplicably for such a visited site, Lalibela’s tourist infrastructure is basic at best. The only paved road is to the airport. Electricity is rationed, so it could go off or on at any time. There are no banks. The food in our hotel was good; however, it was greatly influenced by the Italian occupation decades ago. Ethiopians are extremely friendly and gracious. English is widely spoken. When Texas’ summer heat hits, I’m getting out my green-, pink- and blue-sequined umbrella from Ethiopia.